We have seen that a letter is making the rounds, though it has not yet been sent to us. We appreciate its expression of support for PEN’s work and mission, and agree that there are many writers who merit recognition for courage in defending free expression. A number of people have approached us urging a counter-letter, but we feel strongly that asking writers to declare themselves for or against oversimplifies and needlessly polarizes a complex issue. We have heard and felt powerful support in many different forms over the last few days and don’t see value in a roll-call that pushes people to take a position that may not fully reflect the subtleties of their view. Everyone in PEN is committed to free expression; debate over its meaning and how to reconcile it with other important values is vital. We have created an open online forum for people to share their views, which we are reading carefully. We see this robust conversation as a credit to the strength and diversity of PEN’s membership. Only a handful of people are willing to put themselves in peril to build a world in which we are all free to say what we believe. In continuing publication after their offices were firebombed in 2011 and again after the massacre in January, Charlie Hebdo’s current staff have taken that exact position. The “assassin’s veto” over speech has become a global phenomenon in recent years and, even more vividly, in recent months, when we’ve seen killings not just in Paris but also in Copenhagen and Bangladesh. Reflecting the intensification of violent intolerance for speech considered offensive by some, former PEN American Center President Salman Rushdie has commented that while he would write The Satanic Verses again today, he does not believe that he would survive the reprisals in this era. Charlie Hebdo has positioned itself in the firing line of this battle, refusing to accept the curtailment of lawful speech by those who meet it with violence. It is undoubtedly true that in addition to provoking violent threats from extremists, the Hebdo cartoons offended some other Muslims and members of the many other groups they targeted. 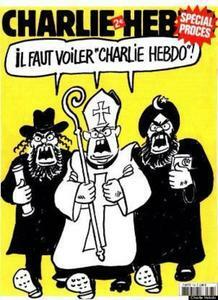 Indeed, were the Hebdo cartoonists not satirical in their genesis and intent, their content and images might offend most or all of us. But, based on their own statements, we believe that Charlie Hebdo‘s intent was not to ostracize or insult Muslims, but rather to reject forcefully the efforts of a small minority of radical extremists to place broad categories of speech off limits—no matter the purpose, intent, or import of the expression. The rising prevalence of various efforts to delimit speech and narrow the bounds of any permitted speech concern us; we defend free speech above its contents. We do not believe that any of us must endorse the content of Charlie Hebdo’s cartoons in order to affirm the importance of the medium of satire, or to applaud the staff’s bravery in holding fast to those values in the face of life and death threats. There is courage in refusing the very idea of forbidden statements, an urgent brilliance in saying what you have been told not to say in order to make it sayable. There are powerful disincentives to challenging head-on the willful shrinking of the space for free speech: doing so poses grave risks of reputation and safety. In the aftermath of the Hebdo attacks, we saw a spike in PEN new memberships from writers, many of whom wrote eloquently about being inspired by the attacks to defend free speech more intently. Charlie Hebdo‘s refusal to retreat when confronted with these threats, coupled with their magnanimity in the face of tragedy, have similarly motivated us to present them with the 2015 PEN/Toni and James C. Goodale Freedom of Expression Courage Award at the PEN Literary Gala on May 5. We recognize that these issues are complex, and that there are good faith differences of opinion within our community. ‎At PEN, we never shy away from controversy nor demand uniformity of opinion across our ranks. We will be sorry not to see those who have opted out of the gala, but we respect them for their convictions. We feel very privileged to live in an environment where strong and diverse views on complex issues such as these can take place both respectfully and safely.